Late in 1864, two large Union armies, one in Virginia and the other in Georgia, were beginning to squeeze the Confederacy to defeat. Grant held Lee’s Army of Northern Virginia immobile at Petersburg, while Sherman, with 60,000 men, captured Atlanta and began the famous March to the Sea. Savannah fell by Christmas, 1864, and mid-January, 1865, Sherman’s invasion of the Carolinas was begun. 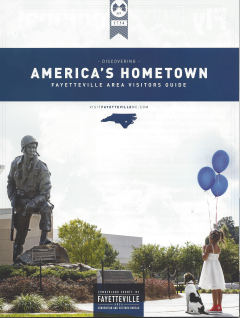 Columbia was captured on February 17th and Fayetteville on March 11th. After leaving Fayetteville, Sherman sought to confuse General Joseph E. Johnston’s Confederate forces by making a pretended advance against Raleigh with the left wing of his army. This wing, commanded by General H. W. Slocum, began its march from Fayetteville along Old Stage Road (present U.S. 401) which connected with Raleigh. Some 25 miles above Fayetteville the road branched near the village of Averasboro: one branch continued north to Raleigh, the other ran to the east toward Smithfield and Goldsboro. 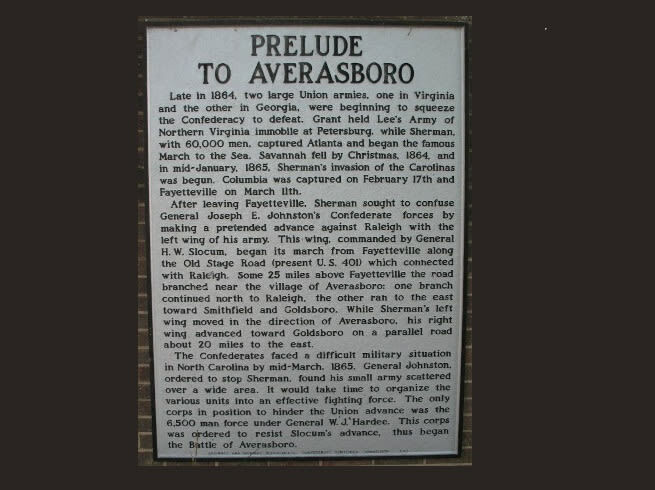 While Sherman’s left wing moved in the direction of Averasboro, his right wing advanced toward Goldsboro on a parallel road about 20 miles to the east. The Confederates faced a difficult military situation in North Carolina by mid-March, 1865. General Johnston, ordered to stop Sherman, found his small army scattered over a wide area. It would take time to organize the various units into an effective fighting force. The only corps in position to hinder the Union advance was the 6,500 man force under General W. J. Hardee. 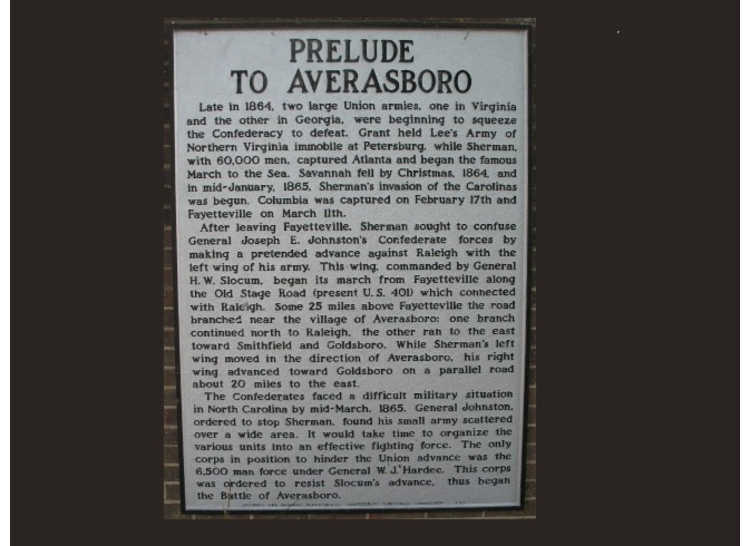 This corps was ordered to resist Slocum’s advance, thus began the Battle of Averasboro.